Ocean Tracking Network an "audacious plan"
Sometimes audacity is vision ahead of its time. 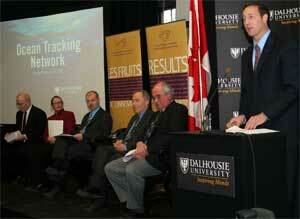 Dalhousie's proposal to create the Ocean Tracking Network — hailed as "the ocean's Internet” — was initially dubbed audacious by a federal review panel, says President Tom Traves. "Thanks to this audacious plan, the best oceans scientists around the world now have the impetus to collaborate in unprecedented research into marine life, ocean characteristics and how a quickly-warming global atmosphere is changing two-thirds of our planet,” he said on February 12, as Ottawa announced its support for the project. The federal government will invest more than $45 million in funding toward the global underwater research initiative, headquartered at Dalhousie University. This represents the largest research award ever received by the university. The $160-million network will enable the world's most comprehensive and revolutionary examination of marine life and ocean conditions to date. A global monitoring system — created with Canadian technology — will follow the movement and behavior of a diversity of marine species, from salmon to turtles to whales. Sea animals will be tagged with tiny electronic transmitters. As they travel, their signals will be tracked by a network of seabed receivers, in 14 ocean regions covering the entire planet. Scientists around the world will be able to access the ongoing collection of data, which will include key ocean indicators such as temperature, depth and chemistry. 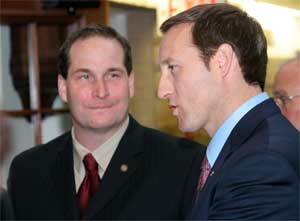 The project shows tremendous promise for Canada, Foreign Affairs Minister Peter MacKay said during the landmark announcement in University Hall on campus. "This critical investment will foster the development of new Canadian technology and a deeper understanding of the effects of climate change. It will help shape the management of fisheries and the conservation of endangered species worldwide,” said Mr. MacKay, also minister for the Atlantic Canada Opportunities Agency, speaking on behalf of Industry Minister Maxime Bernier. Made possible by the International Joint Ventures Fund, the award includes $35 million from the Canada Foundation for Innovation (CFI), supplemented by an additional $10 million from the Natural Sciences and Engineering Research Council of Canada (NSERC), and $327,000 from the Social Sciences and Humanities Research Council of Canada (SSHRC). This will leverage more than $100 million of in kind and financial contributions from Dalhousie's global research partners. The OTN is expected to have a major global impact on pressing environmental challenges, while enhancing Canada's position at the forefront of marine technology, said Dr. Eliot Phillipson, president and CEO of the Canada Foundation for Innovation. 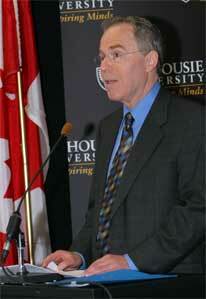 "The rest of the world has taken note that when it comes to research, Canada matters,” said Dr. Phillipson. Dalhousie's proposal was subject to a rigorous merit review and a competitive process, and its success speaks to the timeliness of the research, said Dr. Carl Breckenridge, Vice-President (Research). ÒIt also recognizes the international expertise of Dalhousie's scientists, particularly the leadership of marine biologist Dr. Ron O'Dor,” he said. Dr. O'Dor conducted a flurry of media interviews from Panama City, where he was attending a conference on marine life. The announcement made headlines nationally and around the world, with reports by Associated Press, Reuters and Canadian Press carried on major news outlets. The OTN will provide many opportunities for undergraduate, graduate and professional students at Dalhousie to contribute in a meaningful way to world-changing research, in both sciences and the humanities, said Dr. Traves. "Dalhousie is committed to building understanding and ability in the next generation of leaders, who will soon assume responsibility for the decisions required in an increasingly complex and changing world environment,” he said. Acknowledging his own pride "as an Atlantic Canadian and a Dalhousie graduate,” Mr. MacKay commended his alma mater for creating a worldwide network of oceans research and industry innovators. Such large-scale partnerships among the education, government and private sectors contribute toward Canada's success in the global economy, he said. "Research at Canadian universities helps to drive our economy and improve our lives, locally, nationally and internationally. It keeps us competitive. It keeps employment here,” said Mr. MacKay. Hundreds of Dalhousie researchers are working on a wide range of environmental solutions, noted Dr. Traves, from carbon storage to converting garbage into power. In recent years, Dal researchers have more than doubled the university's research funding to more than $100 million a year, and "more than 80 per cent of the research conducted in Nova Scotia happens on this campus,” he said. Environmental research is also a major priority for NSERC, said Dr. Suzanne Fortier, the national granting agency's president, and an improved understanding of the changing ocean environment will help to conserve fish stocks for future generations. "The oceans of the world influence all life on this planet,” she said.